Lately, I’ve been focusing on appreciating the small things. 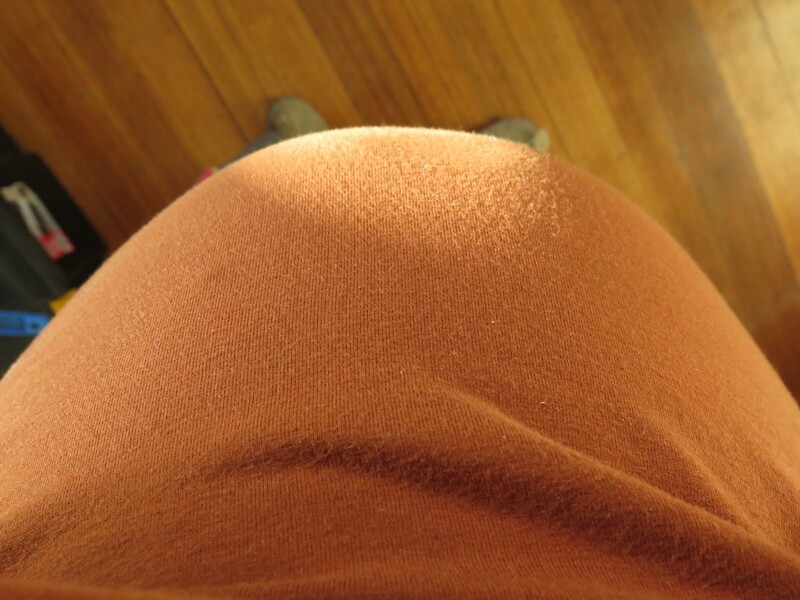 Due to having an ever growing belly and the physical limitations that come with creating another human I have been well and truly slooooowed down. The Bump in progress – babe is due in late December. This means no serious fencing, no helping build retaining walls, no digging holes for the hazelnut trees, no this, no that. For me, this is enormously frustrating, challenging and just so mentally hard. But after ending up doubled over in pain after doing some very mild physical work, I’ve learned my lesson – take it easy Hannah. I’m not complaining, just learning, and trying to appreciate the small things that I am able to do. Like transplanting thyme to create a welcoming, aromatic entrance to our front door. Making yoghurt, and lots of it. 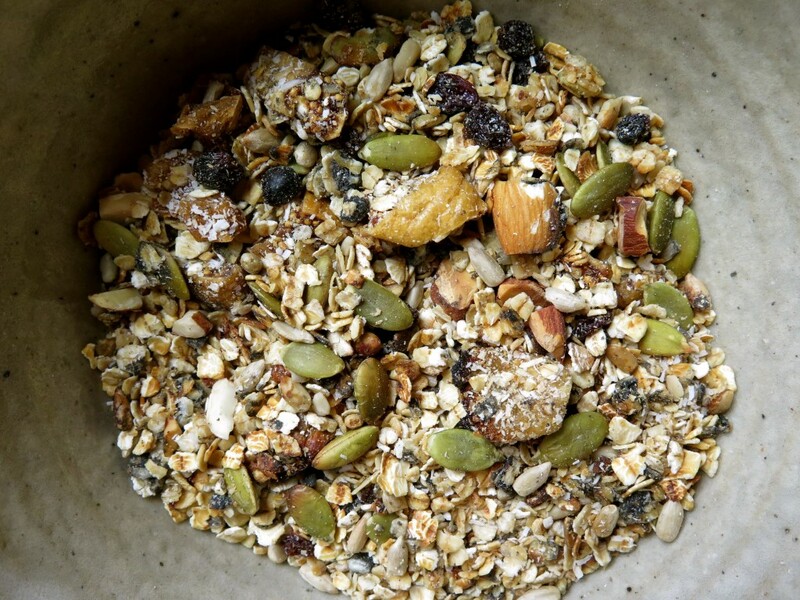 Making home made muesli, lots of that too. Tweaking the fence line, as in adding the top high tensile wire to create the ‘flop’ which is one of the few fencing jobs I CAN do. 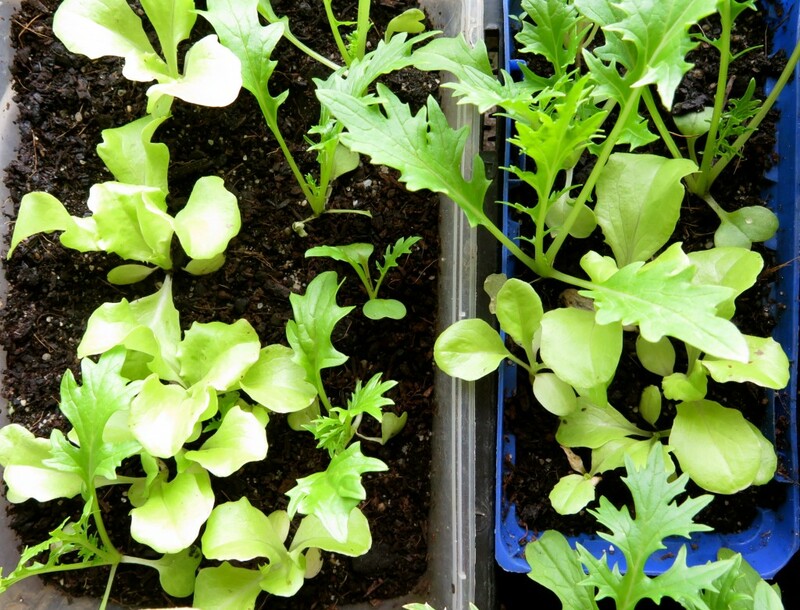 Propagating and potting up seedlings for the imminent Spring plantings. Organising every single workshop and event we’re doing in 2015 so that in theory, I can ‘take it easy’ next year. Hmmmm we’ll see how that goes. I’m also still teaching, designing properties, running The Permablitz Project and thinking about all the good things to come. So there’s definitely not much twiddling of thumbs going on. Just a lot more inside time. It’s lead to some pretty interesting conversations in our house around gender roles and stereotypes in the context of starting a small family. We can see how, through practicalities, women take care of the less physically demanding domestic ‘stuff’, while men do with the heavy lifting etc. For me, it’s been incredibly challenging to slot right into this stereotype and have to watch Anton do all the ‘fun’ stuff. But as we discussed recently, this is a temporary arrangement for us. Once my body bounces back (fingers crossed) we’ll resume our standard patterns as much as possible which sees both of us digging, building, creating, washing dishes and cooking. So, while my body is preoccupied, I focus on the small things, as it’s how I can be useful around here at the moment. The dishes have never been done so regularly, we’re pretty sorted with our propagation and crop planning systems and we’re looking freakishly organised for 2015 work wise. And I must say. A big ups and nod of the head to all the women and men out there who take on the domestic role in a home in a major way. It’s an often under valued, yet critical role to making the wheels turn, you’re friggin amazing and I don’t know how you do it. Respect! We’re in the very early stages of establishing our small mixed orchard which is both exciting and a lot of work. When you live on a steep block everything is a lot of work. Due to our every-changing levels we have quite of lot of earth banks, which are much more affordable compared to installing retaining walls. 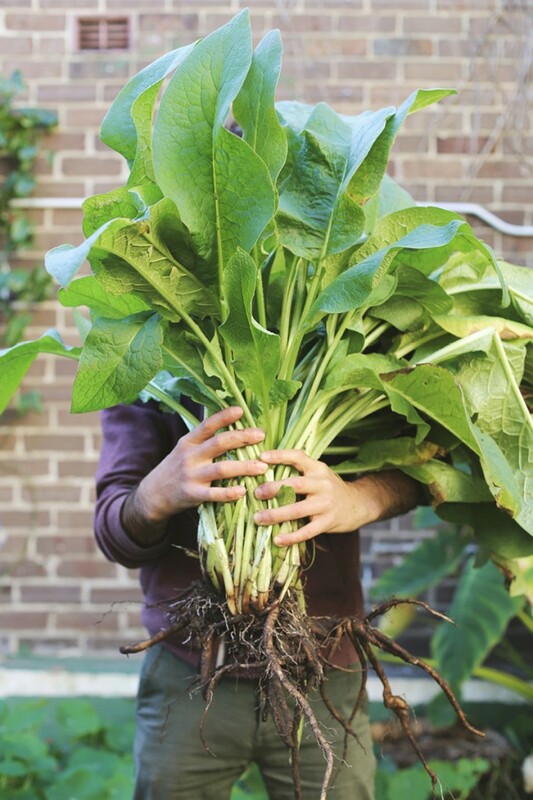 So, we’ve been experimenting with different plants to see which ones can handle the tough love environment – comfrey is one of them. When you’re planting out medium to large areas with plants, learning how to propagate them yourself saves you big bucks, so we do a fair bot of it at our place. Here’s how we do it with comfrey. To get started with subdividing your comfrey plant, find one you like, either in your own garden or a friends, and dig it up. Pop it in a bucket of water before subdividing to give it a good soak and prepare it for what’s to come. 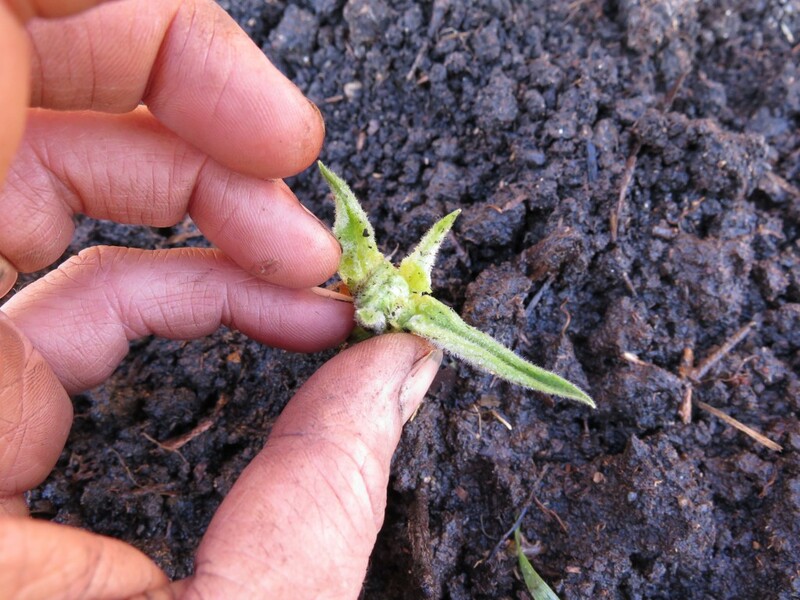 When you’re ready, pull off 98% of the leaves, leaving just the tiniest ones which will still catch and transfer sunlight into the plant’s system. As you can see below, in one plant there are 5 clearly defined ‘sub plants’ which can easily be divided and planted independently, however we’re going to go further and get 12 plants out of this one cluster. How do we turn 1 plant into 12? 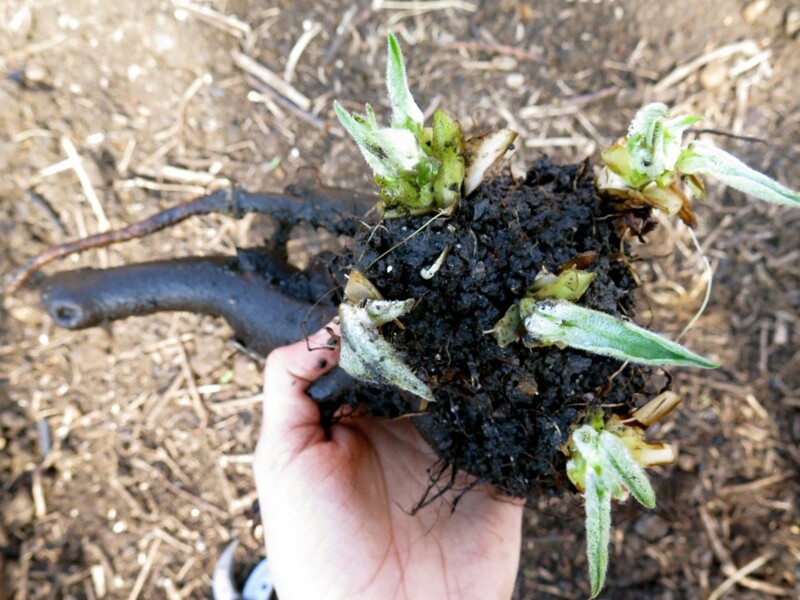 Well, when digging up a comfrey plant, get as much of its root system as possible. 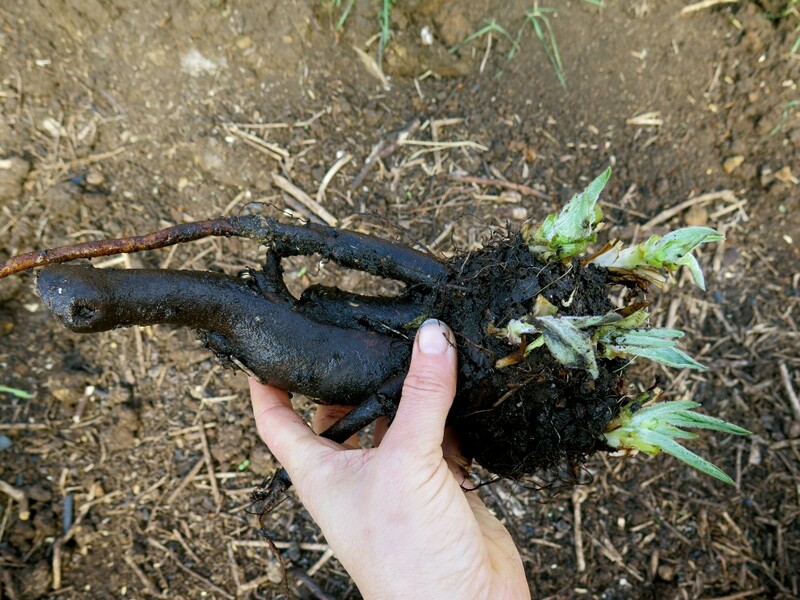 You can chop the roots up into pieces (no less than 1 inch’ish) and plant them separately – each one will sprout into its own plant. This is also why comfrey has a bad reputation for spreading throughout your garden and taking over. Often, comfrey is planted near, or in, people’s vegetable gardens where soil is seasonally turned over and disturbed. 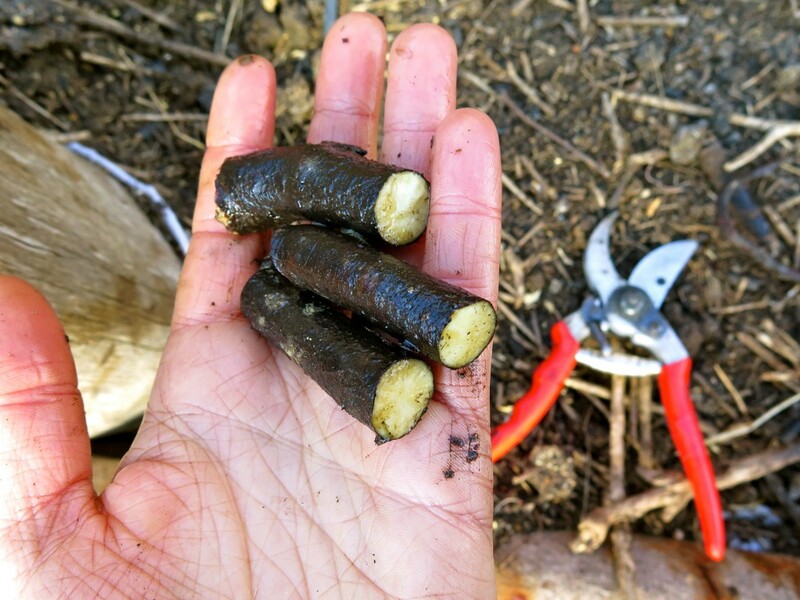 I NEVER recommend this as when you harvest your annual vegies or dig in crops you can unknowingly propagate an impressive amount of comfrey plants by digging into their root zone and chopping up bits of root. Each one of those ‘bits’ then turns into its own, vigorous plant… Taking over your vegie garden and making you have strong, negative feelings towards it. So we only plant comfrey in areas which will never have their soil disturbed, they’re planted once and then left there. For us, this is in our orchard and edible forest garden where it does a bang up job of helping to stabilise steep slopes and being a multifunctional plant with many benefits. So get out your secateurs and chop up your plant into as many pieces as possible, you can also just use your hands to snap the root into sections, however it’s harder to control the sizes you get. Chop up the roots, no smaller than one inch. Each of these root nuggets will sprout into their own plant. We’re planting our comfrey around 30cm apart which is quite close as they bush up thickly and quickly. However we’re doing this purposefully as they’re being planted on contour where they will form a thick, living hedge to help stabilise the bank they’re planted on. 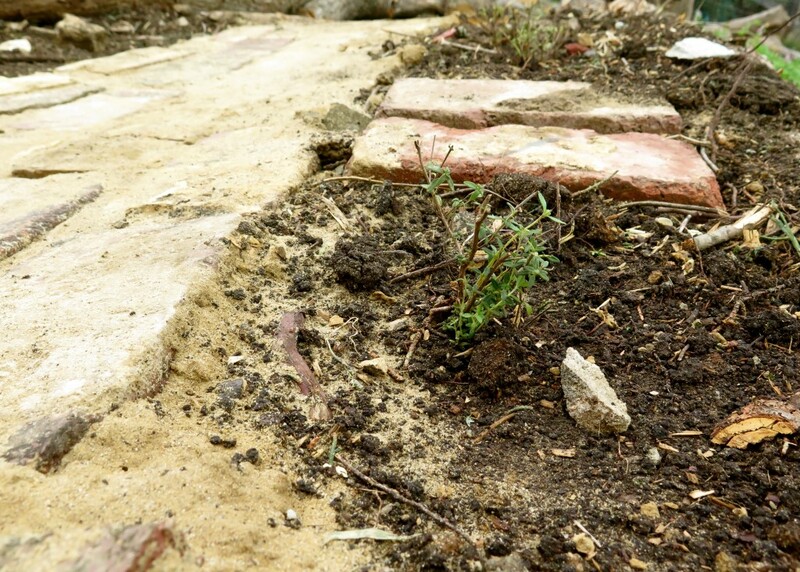 Soil will subtly collect on the uphill side of the comfrey, creating an easier space for other plants to thrive – in this case, this will be a clover ground cover. 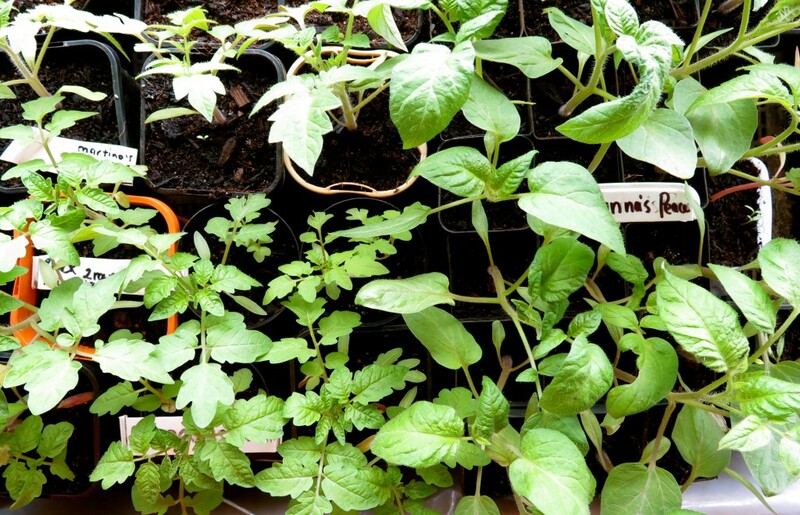 Plant your bits of root or tiny plants into prepared soil and water them in. In no time at all they’ll be ‘up and at em’. One day, in the not too distant future, these little plants will look like this. Image from The Slowpoke. 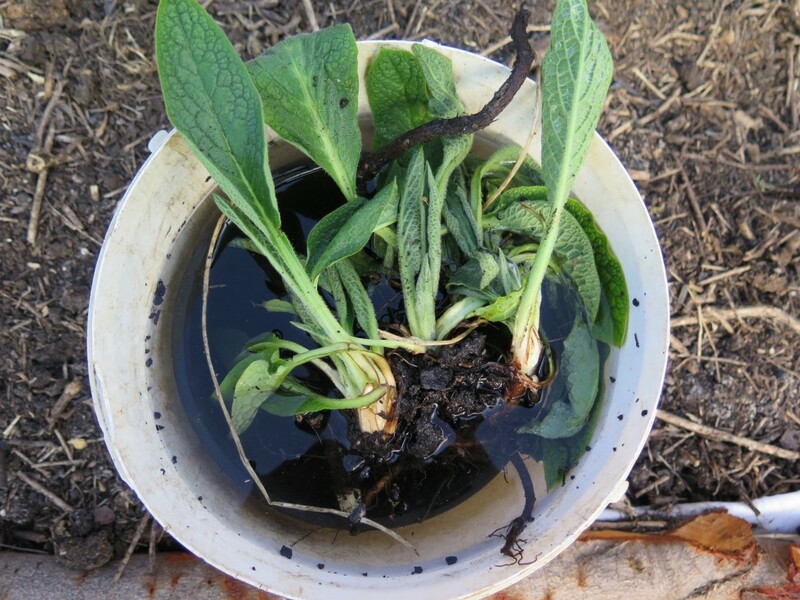 When is the best time to subdivide comfrey plants? Generally in late Winter when your plants are dormant or early Spring when they’re just putting on new leaves. However, comfrey is bloody hardy stuff and I’ve subdivided them at any time of the year and it has still worked. * Your blogger is Hannah Moloney, co-director if Good Life and lover os all things fun and garden-esk. Over the past month or two we’ve been slowly cutting down some rather large cyprus macrocarpa trees which were looming over our house. One in particular was massive and blocked a large portion of sunlight to our house and garden and was a significant fire hazard. As soon as we moved in we acknowledged they ‘had to go’ due to practicalities, but we’ve been avoiding the enormity of the task. It’s such a big task that at one point we tried outsourcing the job to a contractor to chop and mulch it (except the key logs). However when his machinery literally starting sliding off our hill and people’s lives were threatened we called it off. And so, we named it up as another ‘character building’ exercise and have been slowly but surely chopping it down and using as much as possible on site. Here’s how. 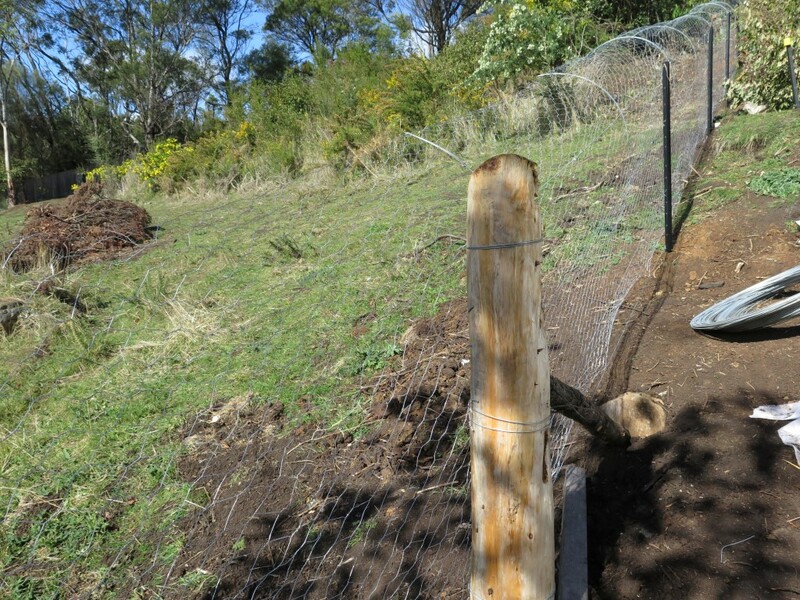 We recently built a floppy fence on our eastern boundary line. Conveniently, we have no termites in Tasmania (yay) and macrocarpa’s timber is well known for its durability for outside uses, so it’s highly sort after for landscaping purposes. Generally it’ll last around 15 years before showing signs of needing replacing, and sometimes more. It sure is doing a swell job supporting our fence line! 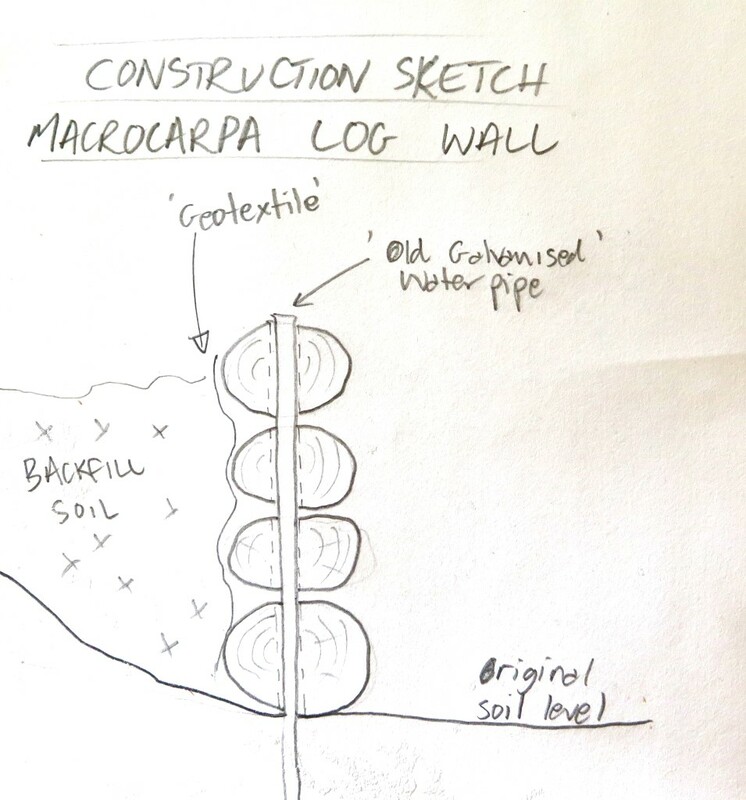 Anton’s just created this very organic looking, strong and down right beautiful (in my humble opinion) retaining wall for part of our orchard. 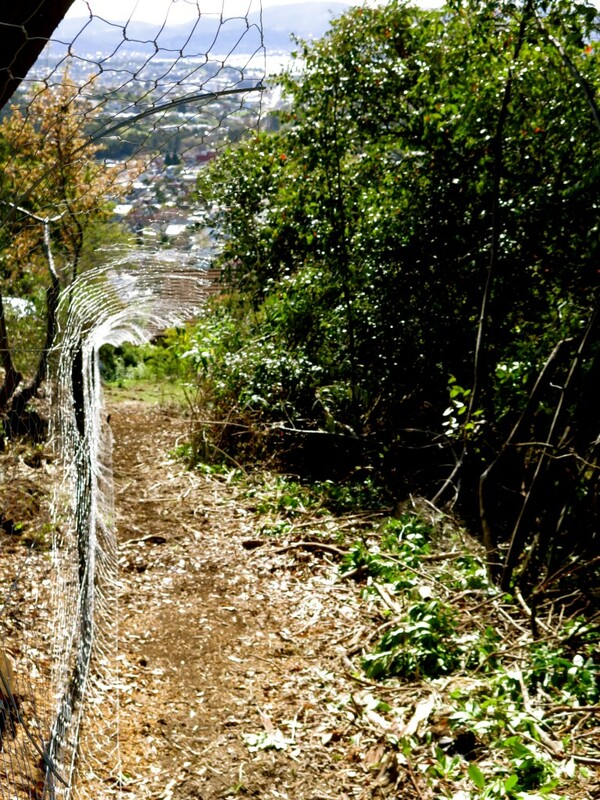 It hugs the bottom of a slope and is home to our apricot and almond trees, soon we’ll also have a diverse understory sprawling throughout. 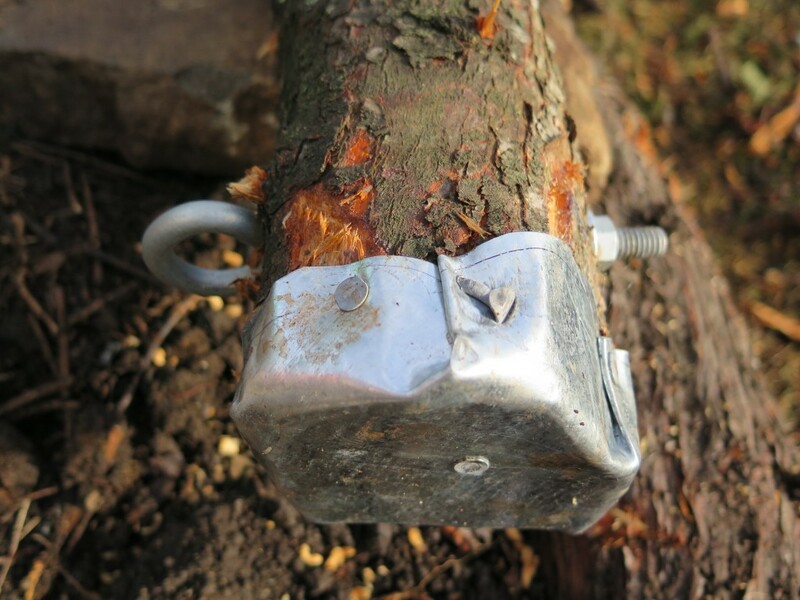 To make them so sturdy, Anton drilled a big hole through the small logs and used some old water pipe (hard steel stuff) as ‘pegs’ which he put directly though the wall and staked into the ground. We then lined it with geofabric and filled it in with juicy top soil. We don’t have a chipper. 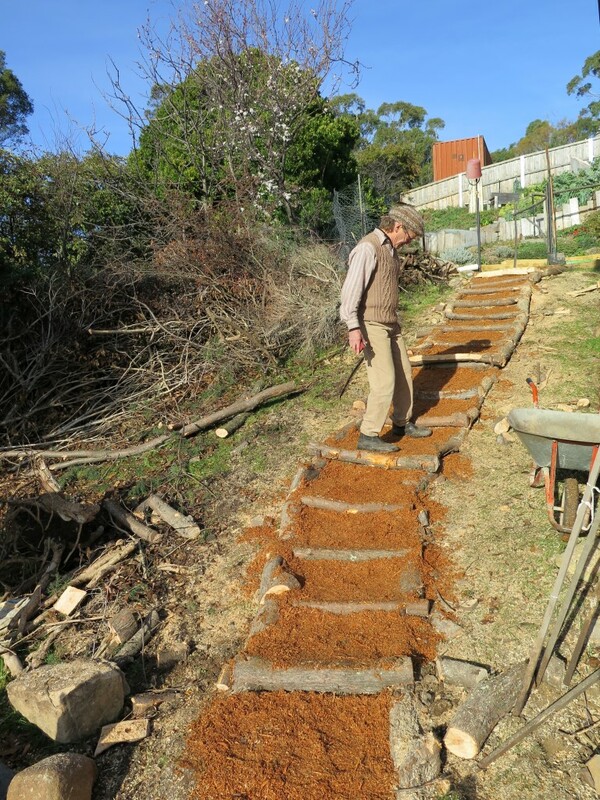 Instead Anton’s been using his chainsaw to ‘mulch’ the greenery that’s come off the macrocarpa and using it as much needed mud proofing on our paths. This has worked surprisingly well. A key thing to be mindful of when using macrocarpa on pathways is that it’s anti-fungal, in an orchard (as the path below is) this isn’t ideal as we REALLY want fungi to thrive in this environment. To speed up the breaking down process we’ll be adding a bit of blood and bone amongst the path. We’re also planning on finding some mature macrocarpa plantings elsewhere which have rotting leaf/branch litter beneath the trees with visible fungi growing and inoculating our paths with it… We’ll see how that goes. 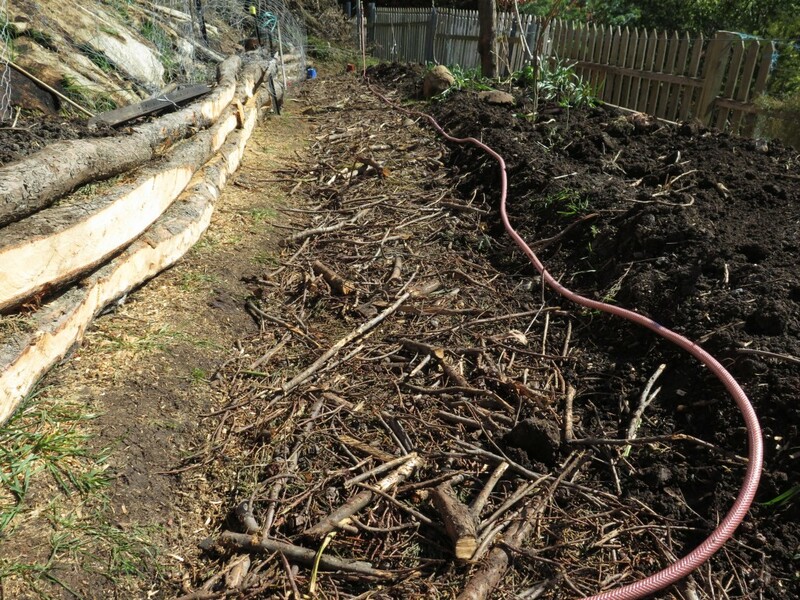 We’re espaliering part of our orchard so we can fit more trees on our urban block. 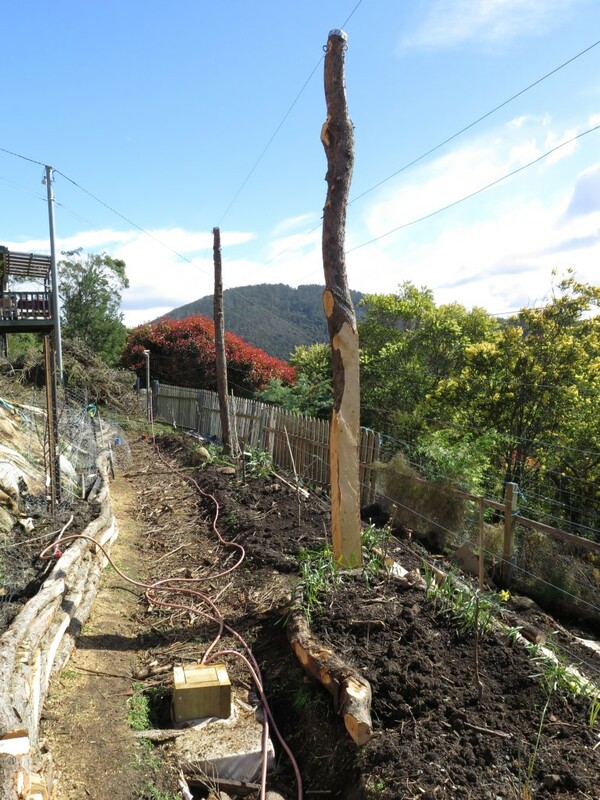 Providing the backbone for this framework are three long (around 5 metres) logs we salvaged from the tree which are doing a bang up job of looking spunky and supporting our very young trees and kiwi fruits. They’ll also eventually have seasonal netting put over them to protect the fruit from being picked off by the many birds which swamp the gardens and orchards around our neighbourhood come harvest time. We put these cute silver caps on the top of each post to ensure the netting can be smoothly put on and off, without getting caught on the rough timber. 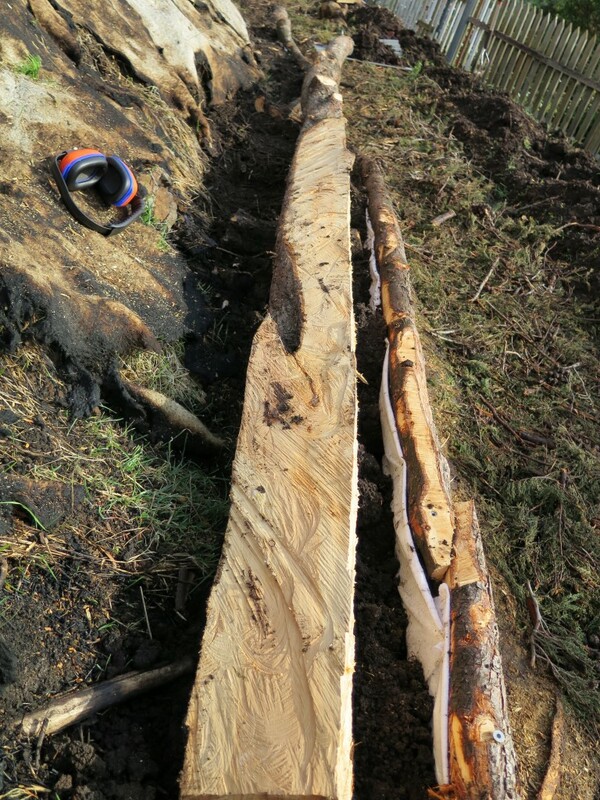 Some of the posts were roughly cut down in size, all with the chainsaw, it’s rough but does the job wonderfully. Stairs – we love em and seriously need them to navigate our slope safely. Once again the macrocarpa has come to the rescue to provide all the materials to create these spunky and solid stairs. We’ve back filled them with sawdust to create mud free, level steps. Below you can see David Holmgren helping bed down the sawdust while he was staying with us recently… Yep, even David gets put to work when visiting. Actually, we couldn’t stop him from wanting to help out with whatever was happening. Seriously top bloke that one. We’ve also used a lot of the green mulched needles as deep litter in our chook run which they’re loving scratching through and chopped up a large fire wood pile for coming years. And finally (or maybe not) we’ve left the main trunk (with some short branches) in the ground in order to build an adventure tree house! Apparently it’s for our kid (arriving in late 2014), however it’s quickly becoming Anton’s most desired place for evening beers, so I think it’s really for him. We’ve left one of the tall spikes you can see Anton sitting on below as a flag pole – because, you know, that’s super important. 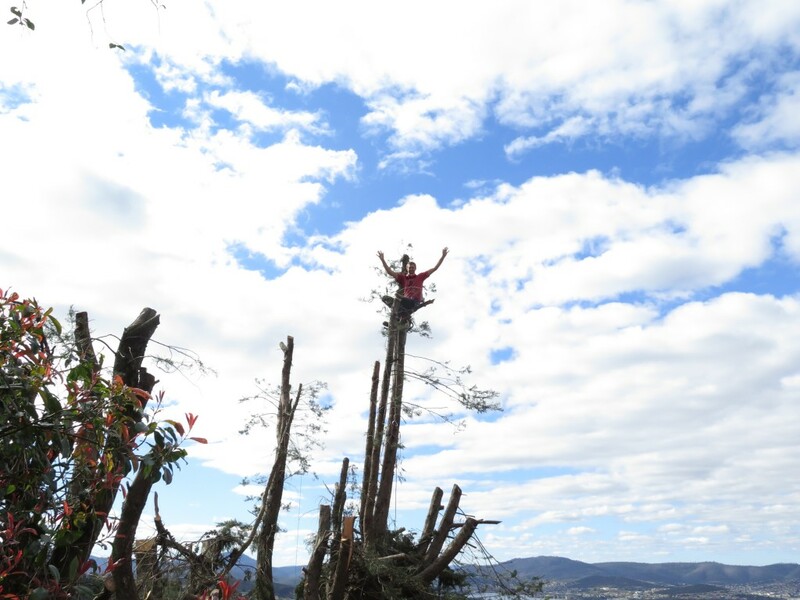 The question we asked ourselves at the start of this whole process was, how can we utilise and respect the embodied energy of this massive tree? Our answer was to convert that energy it’s put into growing so big all these years into creating numerous functional and fun structures which will continue to live on for time to come. So, here’s to many more years of our cypress macrocarpa living on in its new and many forms! * Your blogger is Hannah Moloney, co-director of Good Life and lover of all things fun and garden-esk. As far as we’re concerned, grafting might as well be called ‘one of the best magic tricks ever’. It’s where you literally transform some crazily vigorous rootstock tree with underwhelming fruit into the most delightful variety of (insert name of fruit tree here) ever. Even though it’s a bit late in the season, we’ve been playing around with grafting lately. In particular bark grafting as we have a collection of wild cherry plums which are all pip and no flesh. The positive attribute to these rootstock trees is that they’re incredibly vigorous, so grow like crazy with little/no attention. By doing a bark graft we’re aiming to transform this slightly useless tree into a plum tree which produces abundant, tasty fruit for us, our friends and pantry shelves. Bark grafting involves some drastic methods, first of which is chopping the tree down. I know, it sounds counter-intuitive doesn’t it – but stay with me. 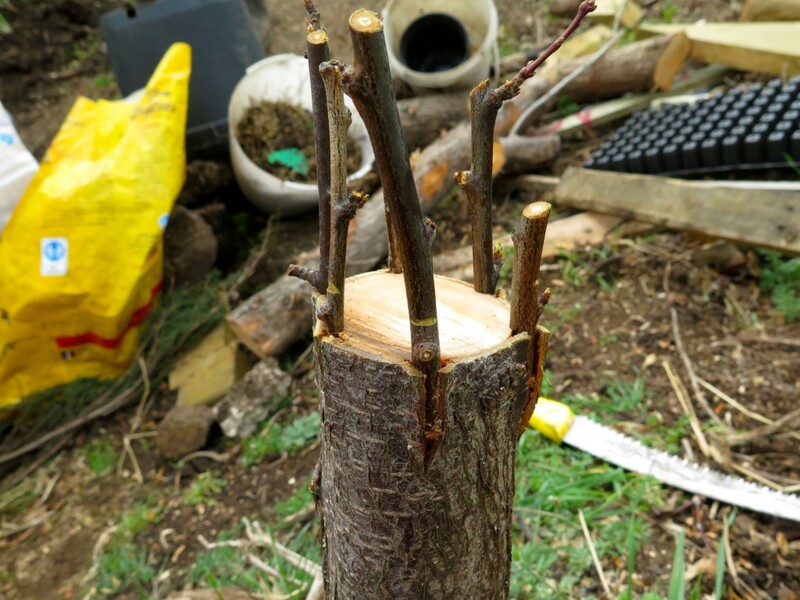 Leaving a ‘stump’ of between 20-50cm, the idea is that you can then do multiple grafts directly into the stump. 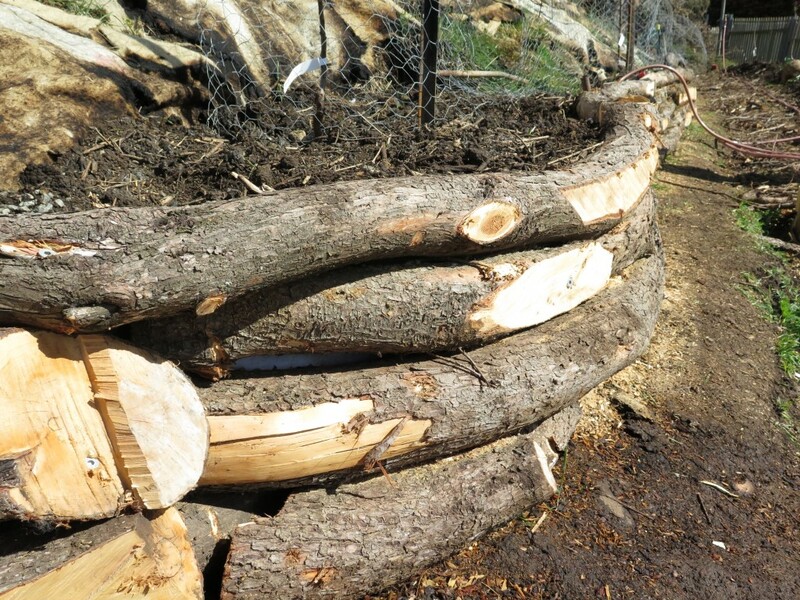 I’ve also seem people leaving much much more of the tree’s shape than just a stump – this can be a good option if your tree has a good healthy structure and is disease free. The down side is that you’ll have more rootstock branches trying to constantly grow back so you’ll have to be rigorous in pruning off their shoots. But how do you magic a new and better variety onto the rootstock? Good question. 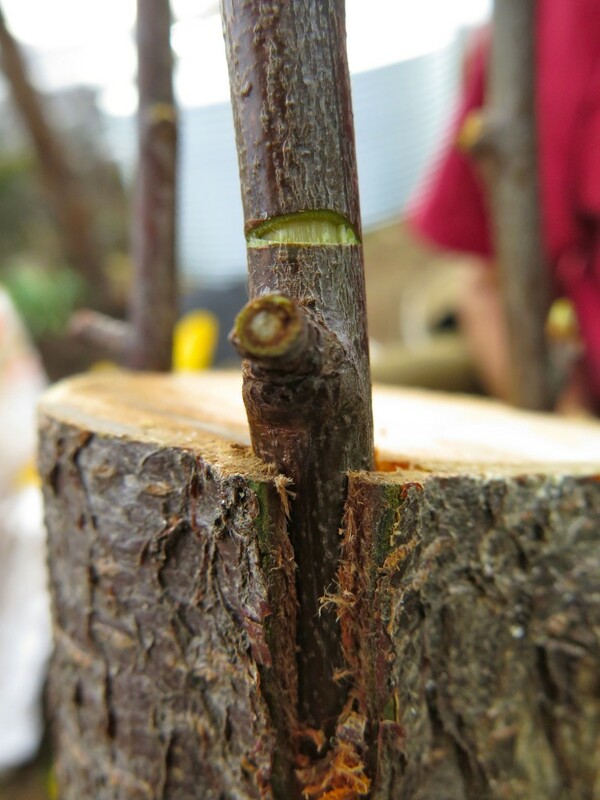 You do so by grafting on scion wood which you harvest from a productive, healthy fruit tree. 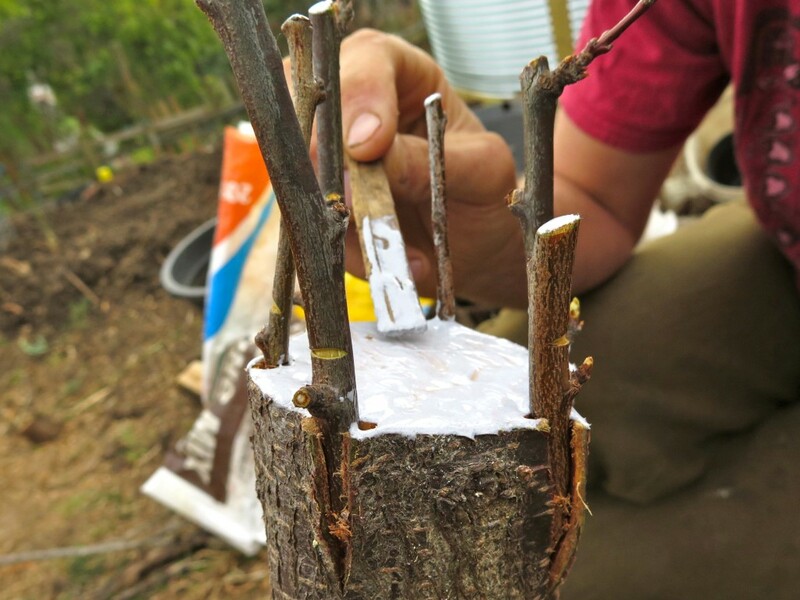 The scion wood is the cuttings you take from another tree with the desired fruit on that you can then graft onto your rootstock. For example we took some cuttings from our neighbour’s AMAZING plum tree to graft onto our very un-amazing wild cherry plum tree. The only thing you really need to remember is that the scion wood and rootstock need to be from the same plant family. The best time to take scion cuttings is in Winter when the trees are dormant and have no signs of budding on them. As soon as they start to bud you’re not meant to bother grafting. However (cough, cough), the scion cuttings we took in the dead of Winter and stored in our fridge started to bud ever so slightly as the vegies also stored in the fridge release ethylene gas which inspires the scion wood to bud – woops. Learn something new every day. But we went for it anyway, because that’s how we roll. You can read a bit more of scion wood storage here. This little diagram shows the important things you need to be aware of, and match up, between the scion wood and the rootstock. The cambium layer is where the real magic happens – if you can line the two up then you’re onto a good thing. Diagram from here. 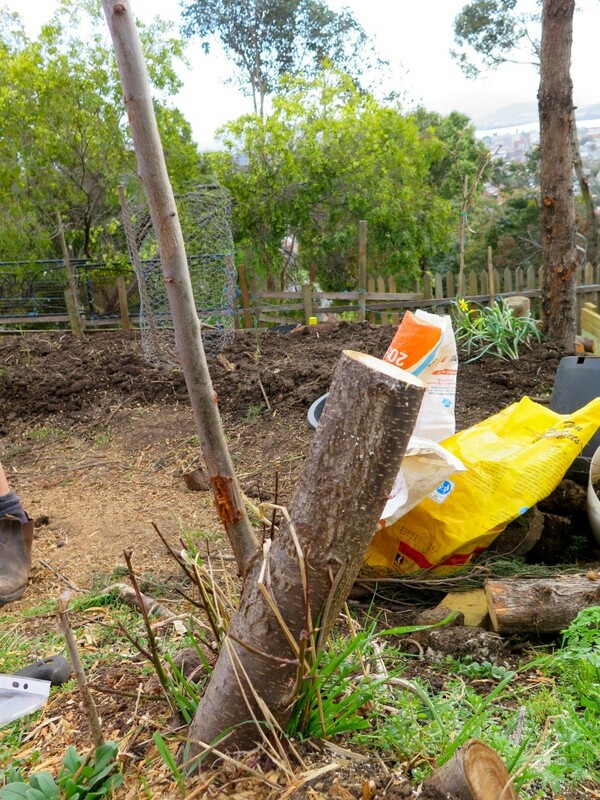 As mentioned, we chopped down one of the cherry plum trees on our place to graft – here’s the full process we went through. Step one, chop the tree down, however we’ve left one branch belonging to the root stock to ensure that the tree will still ‘draw sap’. Apparently this increases the chances of the grafts succeeding, eventually we’ll chop this branch off. 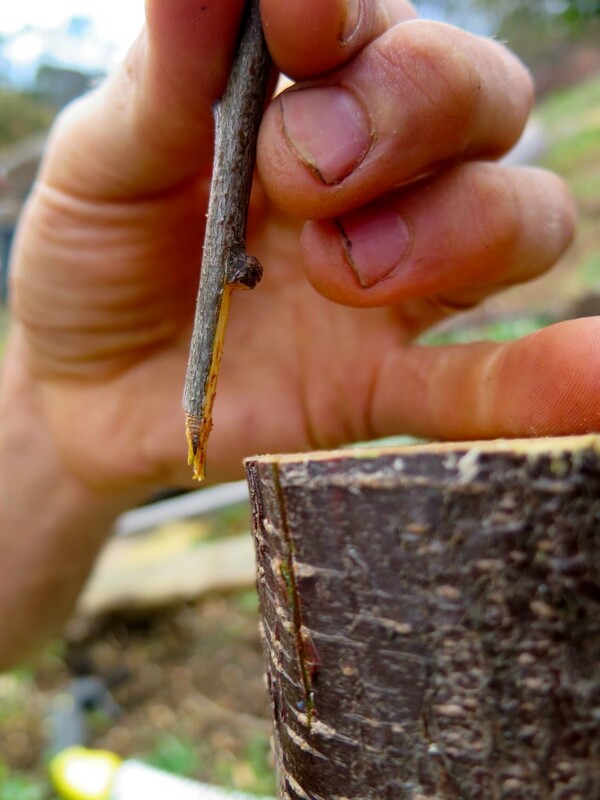 Next thing to do is get your very sharp grafting knife and make some slices down the side of your stump which match the length of you scion wood graft (see photo below). 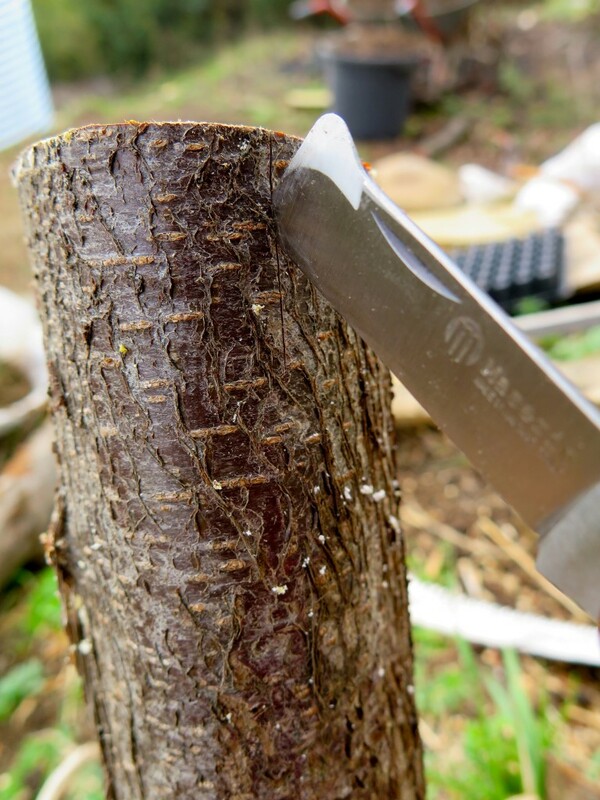 Also using your knife, gently peel this bark back to allow the scion wood to be slipped inside. In hind site we should have trimmed the edges of the scion wood as well (down their long side) to increase the contact between cambium layers, but we’re practicing – and practice makes perfect and mistakes are expected to be made along the way. Also, the end of this particular graft is a bit ratty, generally you’re aiming for a super clean finish, but like I said – we’re practicing. 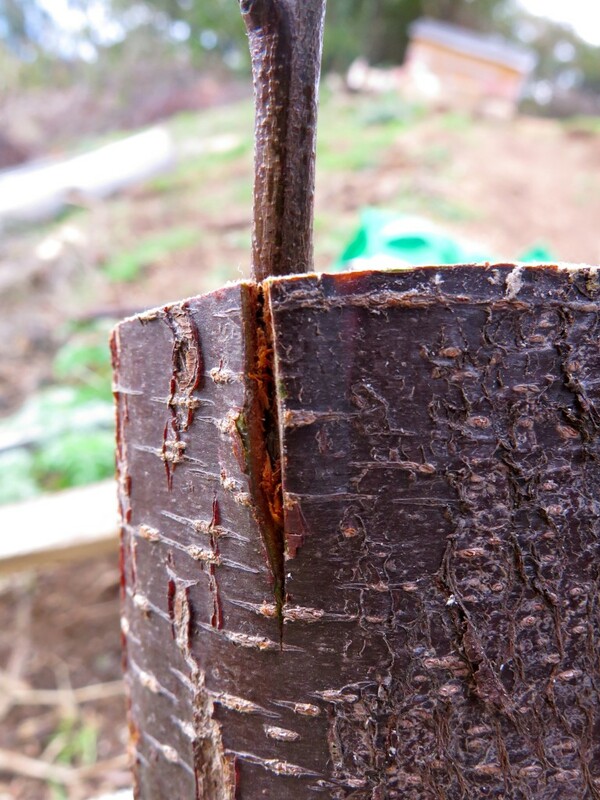 Next up, gently wriggle your scion wood into the bark until it perfectly matches with the level of the stump. It’s really, really important that you aim to get the two cambium layers to match up, if they don’t, the graft want work. 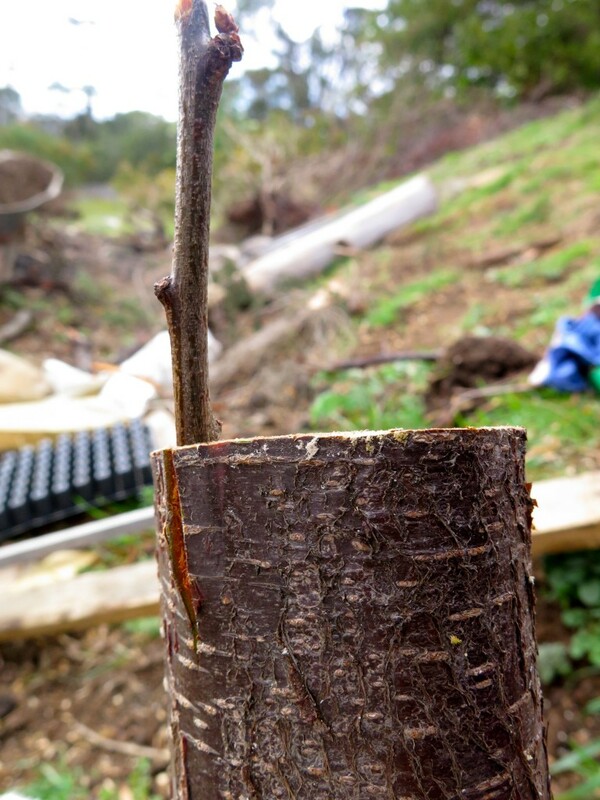 Some people actually put a nail through the scion wood and into the rootstock trunk to help ensure it doesn’t move. We chose not to do this, as you’ll see below. Now this is perhaps one of the most exciting things I’ve learned this year – it’s called ‘notching’. Notching means cutting a small notch above the bud you most desire to shoot, this inspires this particular bud to shoot as it thinks it’s under threat of dying. Make sure your knife is SHARP so you can get a clean cut. Notching helps determine how the plant will grow, ensuring that all (if not most) bugs grow away from the centre of the tree. You don’t want the buds growing into the centre as they’ll start to cross with one another and get tangled which increases the chance of disease (due to decreased air flow) and is darn awkward to harvest and maintain. Six grafts, all with notches to encourage them to grow out, instead of in. 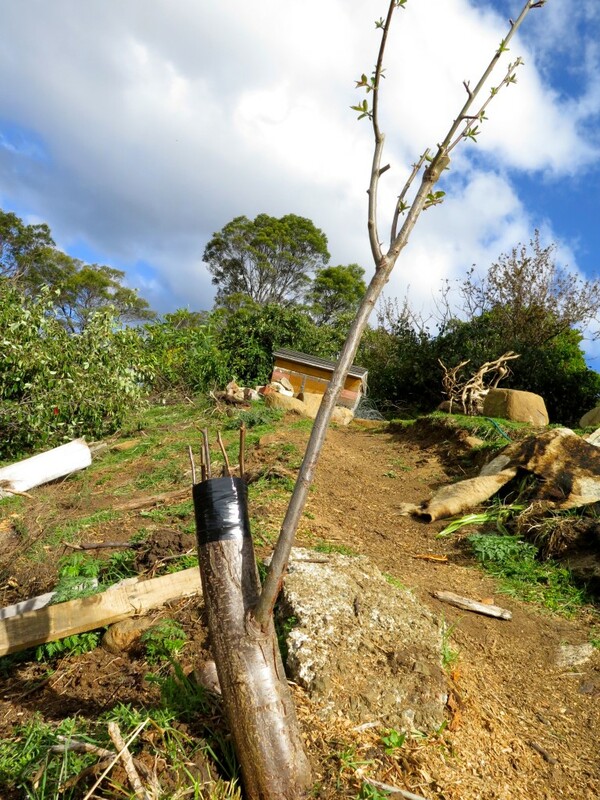 I’m so excited by this simple technique and have also used it in our very young espaliered orchard we’re currently setting up – more on that another time. Next up, we painted all exposed cuts with some eco friendly goop called Tree Stac which protects wounds from unhealthy bacteria or disease moving in. Finally, we bind all the grafts with electrical tape (as seen below), this tape was recommended to us instead of grafting tape as it lasts for a bit longer. And now we wait and watch to see what happens, despite our lack of perfection we still have high hopes that at least 50% of the grafts will take. 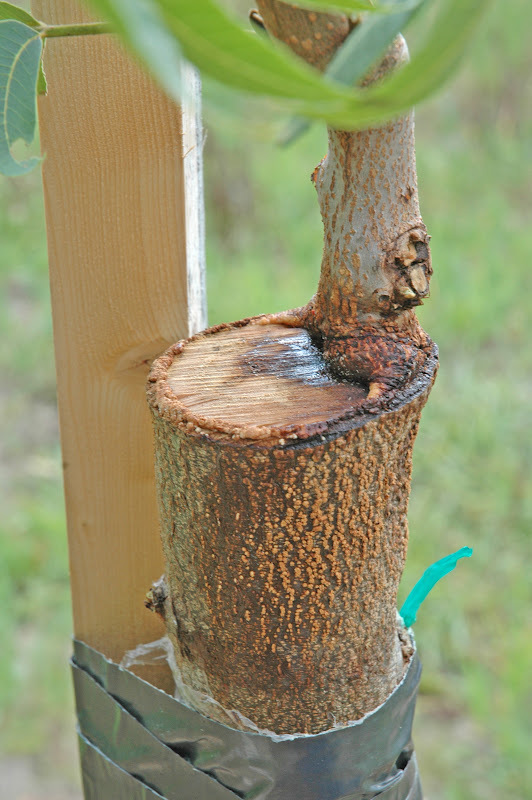 An example of a successful bark graft on a pecan tree. Image from here. Recently I went to a grafting workshop with Nick Magnus at Woodbridge Fruit Trees – it was humbling as I have so far to go in developing good skills. But I loved it, especially when Nick affirmed my own approach to gardening by saying something along the lines of: “If your graft doesn’t work, just try again next year, gardening is very forgiving, just keeping learning and developing your skills”. And so we do. Graft on! Guerrila Grafting: Folk who graft fruit bearing branches onto non-fruit bearing, ornamental fruit trees. Over time, delicious, nutritious fruit is made available to urban residents through these grafts. We aim to prove that a culture of care can be cultivated from the ground up. 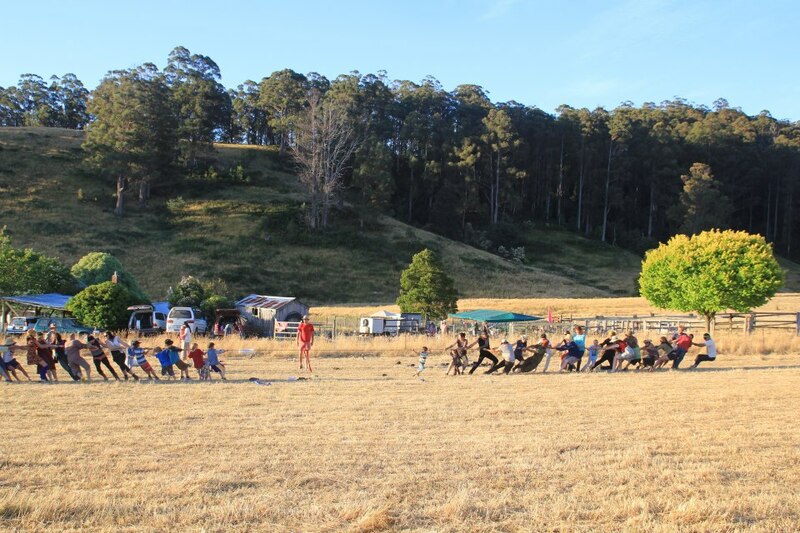 Woodbridge Fruit Trees – Based in Southern Tasmania, this family business is internationally respected for being some of the most knowledgeable people around when it comes to anything to do with fruit trees, look them up! Yoghurt: a fermented milk product produced by the bacterial fermentation of milk using a culture of Lactobacillus delbrueckii subsp. bulgaricus and Streptococcus thermophilus bacteria (also simply called cultures or starters). 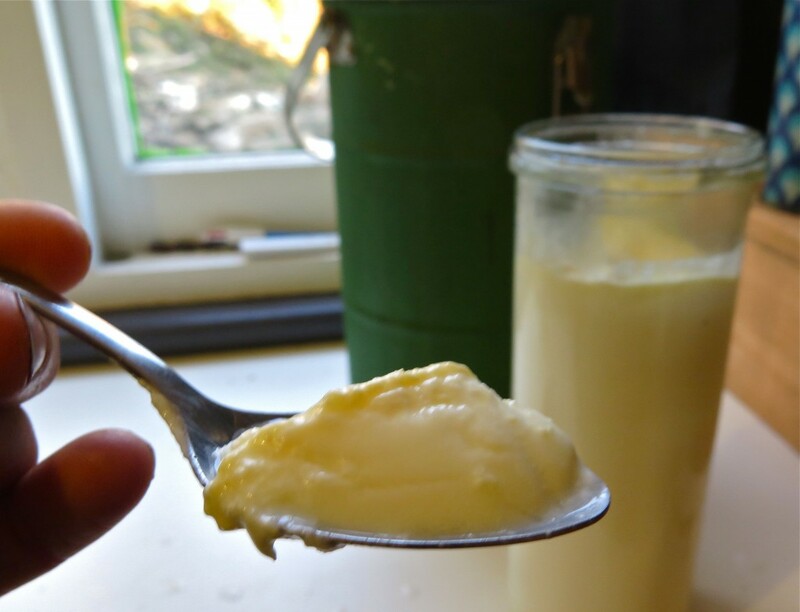 Fermentation of lactose by these bacteria produces lactic acid, which acts on milk protein to give yoghurt its texture and its characteristic tang. Milk: Ideally full fat, however you can make it out of ‘skinny milk’ if you like, I believe it just want set as well (I’ve never tried as I always head straight for the full fat option). A starter culture, i.e. 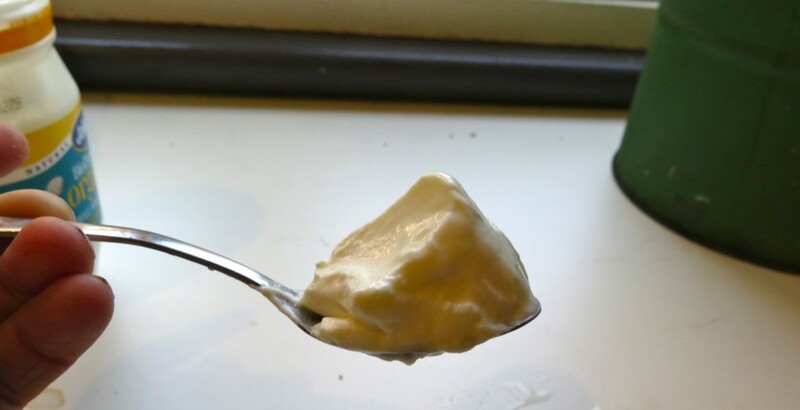 a tablespoon of existing yoghurt – this is enough for 1 – 2 litres of milk. Thermometer (designed for cooking, brewing or canning) for people starting out this is super helpful. A system to keep your yoghurt warm for 6-12 hours, we use a thermos (more on that below) but I’m also a fan of the hot box. 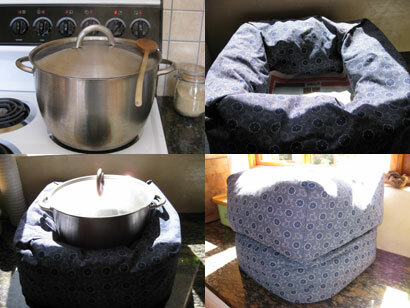 The hot box is an insulated space where you can put in food in pots/jars to continue cooking or fermenting. This example is a purpose built system, these days I just use a cardboard box (or esky) and a sleeping bag – it’s that easy. Image from here. Heat the milk on your stove to JUST before boiling point, do not let it boil (this is approximately 80 degrees) and then turn the stove off. Apparently if you want super thick yoghurt, i.e. 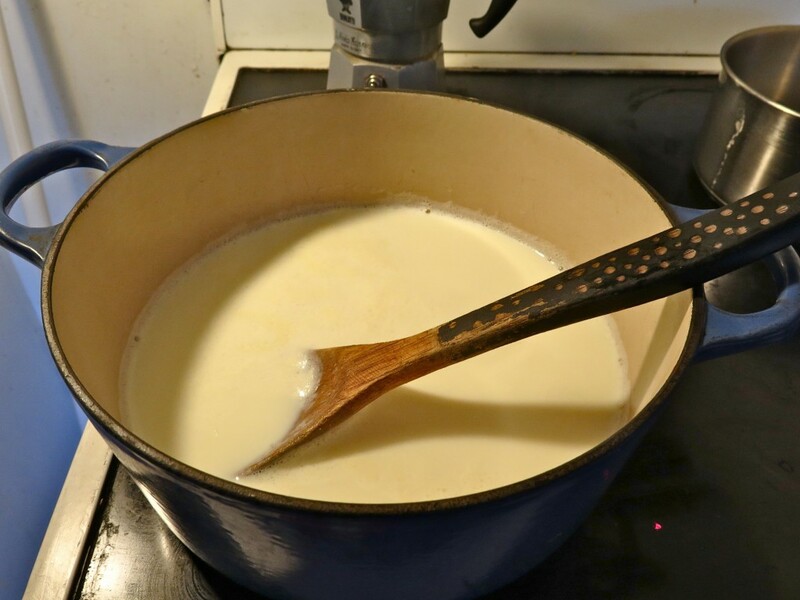 you don’t want the whey (the watery liquid) to separate form the curd, you can keep it at 80 degrees for around 20-30 minutes and then take it off the heat. Let the milk cool down to 40 degrees by either putting the pot in a sink full of cold water or just wait for it to get there naturally. If you haven’t got a thermometer, drop some milk onto your wrist to check it, once it feels warm (but not too hot) it’s ready. Someone once described that it should be the temperature of milk you’d feed to a baby – so that’s how I currently test it. Once your milk is at 40 degrees, stir in your starter culture of existing yoghurt – I like to choose the thickest and most natural yoghurt (sugar/flavour free) I can find as my starter. We call this ‘adding in the good guys’ as your starter culture is ALIVE with a few million/trillion bacteria who are beneficial to your gut and general health, cool hey! Pour the mixture into your vessel of choice, these days we use fowler jars as we happen to have a lot of them. However you can use any vessel, glass is my personal favourite. Make sure it’s been well cleaned before you use it, I don’t do a formal sterilisation process anymore as I’ve found it’s not necessary. 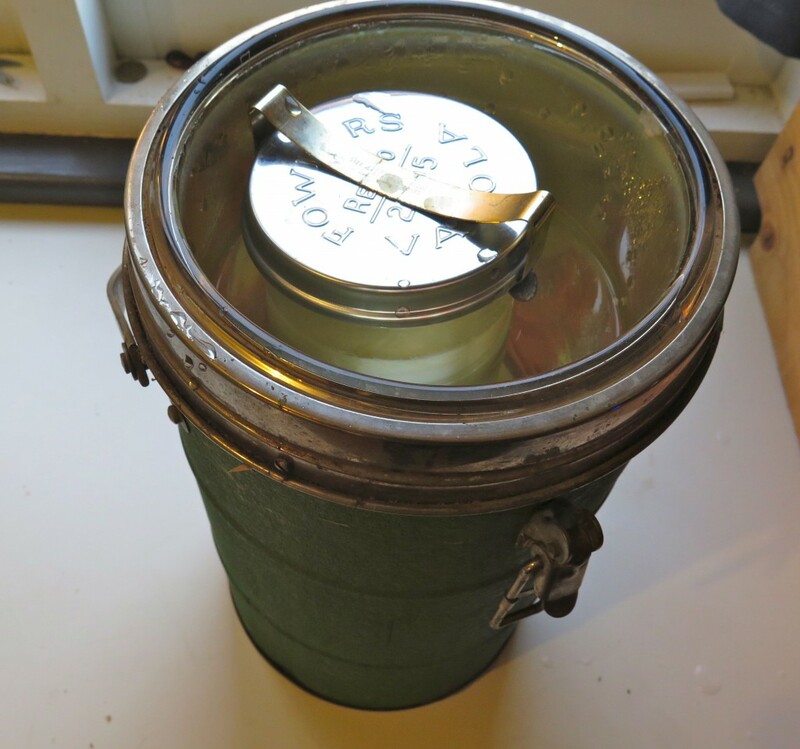 Once the lid is on, put the jar into a system which will keep it warm for 6-12 hours. I usually make it in the evening so it’s ready first thing in the morning for breakfast. Currently we’re using a thermos with luke warm water (not boiling!) to keep the mixture warm, however a simply hot box system is also more than adequate. 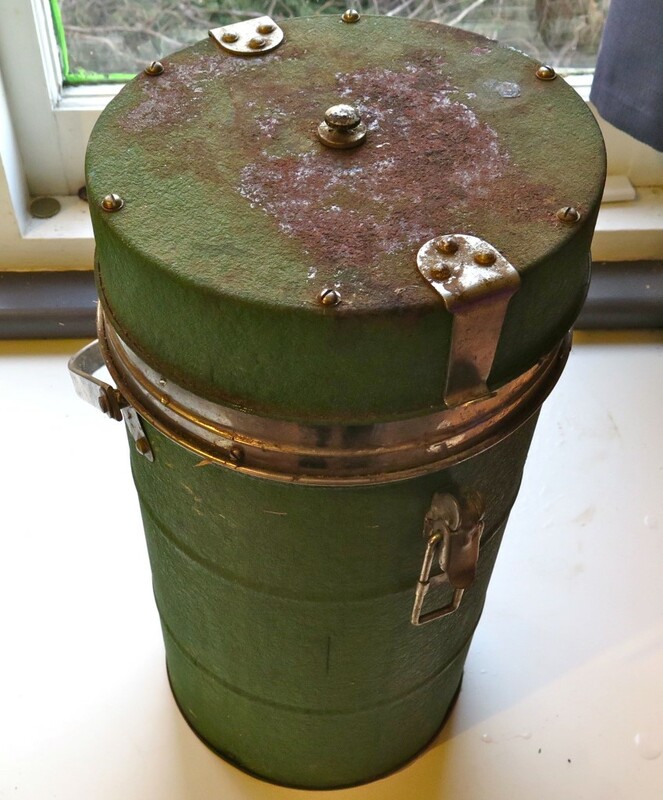 Anton found this amazing thermos at the op shop around 12 years ago. We haven’t actually used it (as it’s just so big) until we realised it’s perfect for yoghurt ‘brewing’. It’s now found its true purpose in life and lives permanently on our kitchen bench. After 6 – 12 hours your yoghurt should be ready to go. First thing I do when I get it out of the thermos is put the jar on its side and see whether it can hold its shape (as below). I’ll eat yoghurt mostly for breakfast with muslie and fruit, however it’s also one of my top snack foods at the moment, so it doesn’t last long :-). Make sure you keep a small amount as your culture for your next batch so you can keep making it without having to buy new starter culture each time. I’ve found that after 3 – 6 batches it can start to go a bit slimey so will sporadically buy a new culture to ‘re-boot’ it. The more you look online and in various food books, the more recipes and advice you’ll find about different yoghurt techniques. Years ago, I started off following very strict rules which have all now faded into the background as I realised our culture (not the bacteria, but us) is super paranoid about sterilisation, germs and that we really like gimmicks (utensils and equipment) which you simply don’t need. But find what works for you best and give it a go – this is simply the right way for us. Interested in all things fermented? 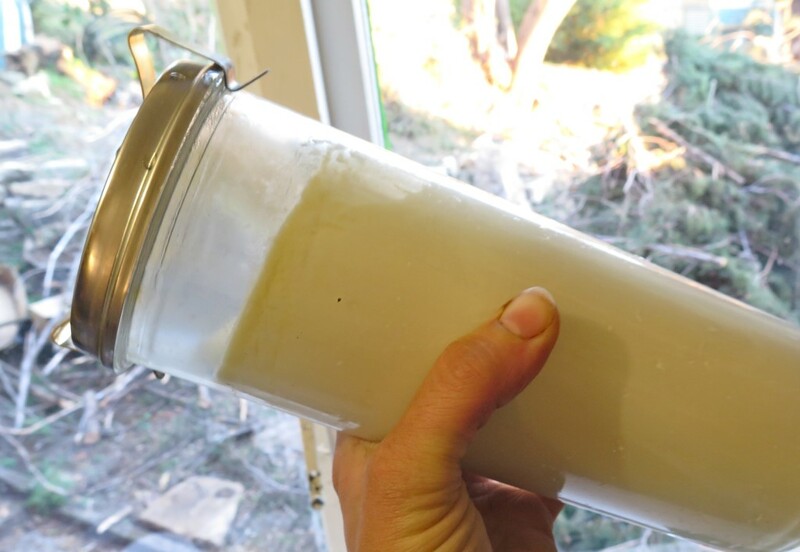 Come along to our Fermentation Fest this December 6th in Hobart town to make yoghurt and SO MUCH MORE! Track down a copy of Wild Fermentation by Sandor Katz for a wealth of insight and recipes. 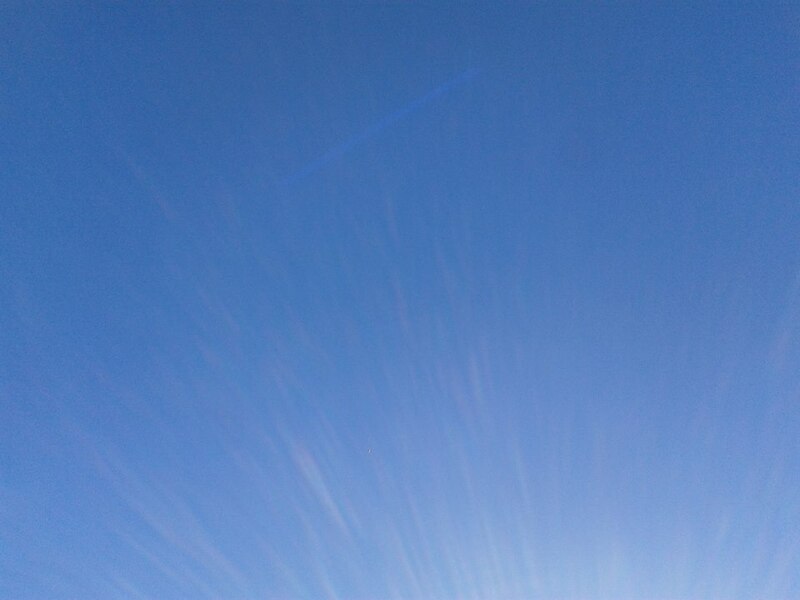 There is more sun action – this glorious ball of warmth starts to stick around longer, increasing our day’s length to luxurious, long evenings. This means that even while we might be on task with projects all day, there’s still time for swimming in the ocean, a BBQ with our mates at the park or evening gardening sessions where we stumble inside around 9pm and only then start thinking about dinner. Actually Spring is usually when we start to eat outside around the campfire, which is pretty much the best thing ever – so we don’t really come inside until bed time. 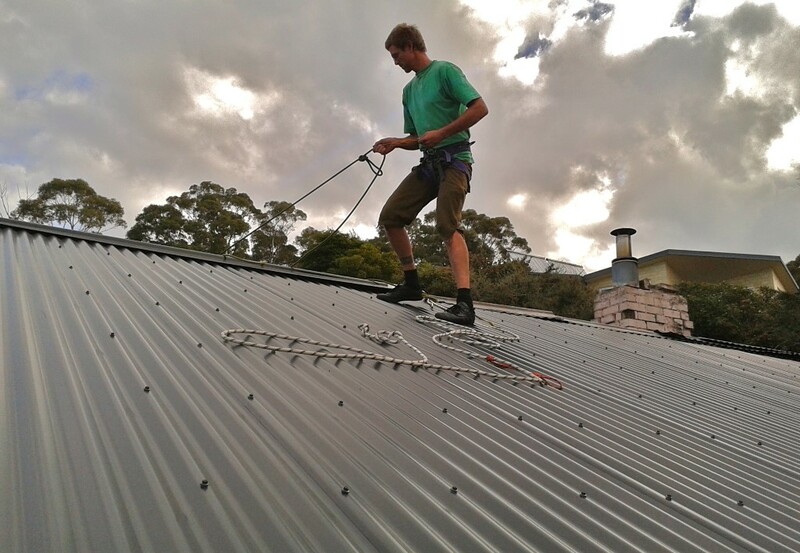 Also known as the windy season, Spring is the time where we generally pray our roof doesn’t fly away – which it want cause we just re-roofed it and put a mega load of roofing screws in. We know that over the next few months there will be some crazy wind storms where we’ll have to straighten our tomatoes and that we may loose some corn or beans to the winds gods and goddess… So what do we do? We plant them in tight clusters and we plant a bit extra, just to be safe. Look at all those beautiful roofing screws – perhaps a little over the top, but the roof isn’t going anywhere. 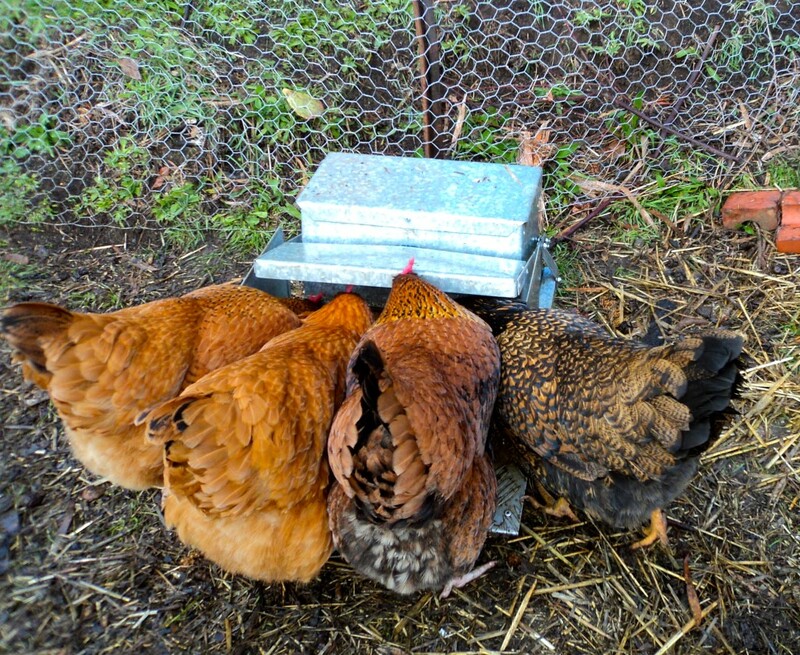 After a decent Winter hiatus our chickens and duck (yes, just only one lady duck at the moment) are back on the lay which means everything egg is on the menu again. Our diets change drastically with the seasons, although due to our mega preserving sessions we’re still happily eating tomatoes, beans and cucumbers from last Summer. But we’re looking forward to the fresh factor and crunching into everything that the warmer months bring. Right now we’re nursing a couple of thousand of babies at the moment – of the seedling variety. 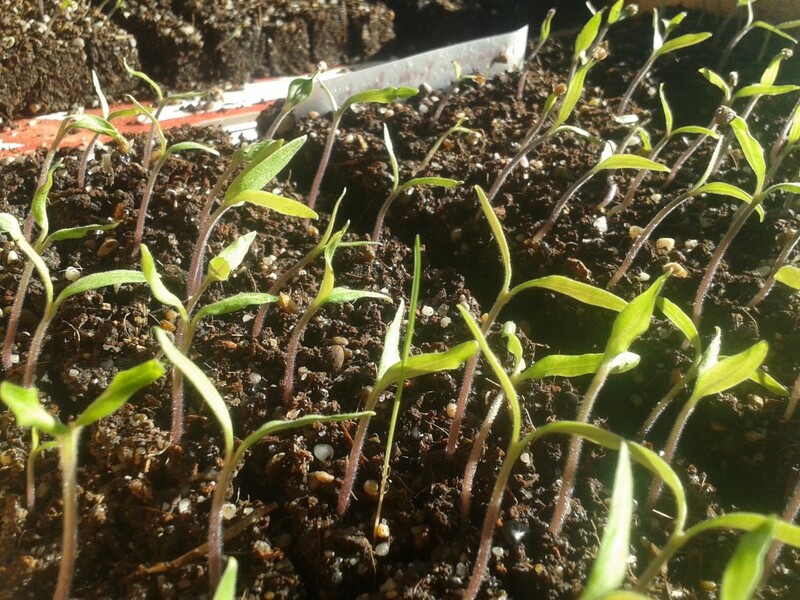 They’re not actually all for us, we just happen to have a wicked sun room so are propagating a hell of a lot of tomatoes for a soon to be announced project – which must remain secret for the time being. But all through late Winter and early Spring we’re attentive parents to these green babies, making sure they get watered first thing in the morning while we drink our coffee. As they grow up and move out into the garden our rhythms change and we drink our tea and coffee outside – checking any slug damage, killing slugs etc. 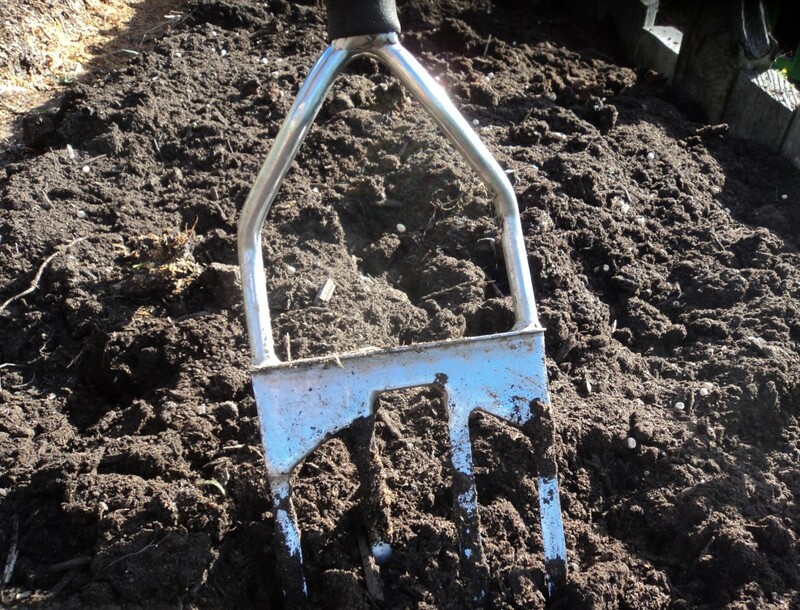 Soil is always a bit of a focus around here – but come Spring we start digging in green manures and making compost pile/s with the excess green waste from the Winter crops we pull out. And then it’s on to prepping the beds with compost and perhaps some gentle aerating for the new crops. When the soil’s happy, we’re happy, so the seasonal changes allows us to check in with it in a major way. Having grown up in Queensland, I don’t think I owned a proper pair of shoes until I had to start school. As a result I’m a broad footed lass who’s feet long to be outside and free. 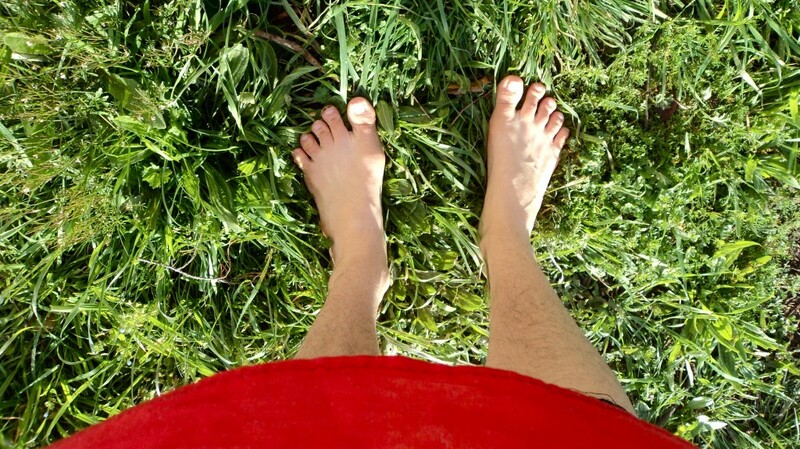 This is the season where we can dust off the thongs or just go barefoot (my favourite) and toughen up our soft, white feet with pure sunshine and dirt. As much as we try not to, we do tend to hibernate in Winter. It’s just that our fireplace and books are HEAPS more enticing and cosey than navigating chilly, wet nights or days. Come Spring though, you’ll find us well rested and seeking out friends in their kitchens, down the street or out in their paddocks. A flash back to last Summer at the Fork and Hoe Farm (some of our best mates), these guys really know how to play. Happy Spring to everyone on this side of the world. May you notice how your living patterns change as the seasons do… And may your savour it all :-).